It’s your worst fear: your furnace has been red tagged. This is a situation no homeowner wants to be in. You rely on your house to keep your family both comfortable and safe. A red tagged furnace puts all of that in jeopardy. If your furnace has already been tagged or you feel unsure about its safety, it’s time to bring in the professionals. Do you have a red tagged furnace in your home? There is only one thing to do: contact qualified heating contractors from Heating Ontario. A red tag on your furnace means that it could be dangerous to your home and family members. If your furnace has been declared unsafe at any point, it is time to get in touch with a member of our team. We believe that nothing is more important than your well being. That is why our Heating Ontario professionals provide a range of replacement and repair options for your heating and cooling system. Whether your furnace requires a new part or a new HVAC (Heating, Ventilating, and Air Conditioning) unit altogether, we take care of it…fast. We know that time is always of the essence. The faster your furnace is back to normal the sooner you can get back to your life! Are you wondering why your furnace has been tagged? There are a number of reasons why this may happen. Some of the most common include a cracked heat exchanger, a gas or carbon monoxide leak, a potential fire hazard, an electrical problem, or an improper combustion within the combustion chamber. All of these issues are extremely serious and can be potentially fatal if left unresolved. That is why it is never a good idea to put off those essential repairs. 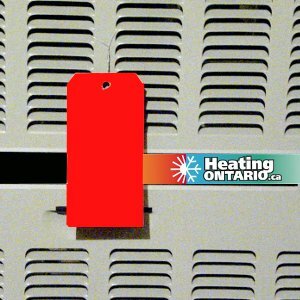 Now that you know the safety issues that can cause your furnace to be tagged, it is time to understand the different types of red tags. If a problem is discovered, a technician will issue either a tag A or a tag B. Tag A means that your gas supply will be shut down as your furnace is a major threat to your overall level of safety. In that case, you will need to contact a professional immediately to have the problem resolved. If you have been issued a tag B, you have 45 days to get the problem fixed. However, even if you have been given a tag B, it is important to act quickly. The last thing you want is for the situation to become worse – or to put the people you love in danger. What should you do if you have a red tagged furnace in your home? Speak to one of our Heating Ontario professionals. With years of hands on experience in the industry, we know how to tackle even the most complicated problems connected to your HVAC unit. Whether you need repairs performed or new furnace installation, we go the extra mile to make sure that you always get what you need, when you need it most. Do you have a red tagged furnace? Then there is no time to lose. Reach out to one of our Heating Ontario professionals today. We deliver quality results that keep your home – and your heating and cooling system – safe and efficient day after day. If you need more information on Heating and Cooling Repairs & Installation, Contact Us at: (click-to-call): 647-591-2683. At Heating Ontario, our professional and experienced staff members know how to keep your home at the right temperature.